For the original 2005 game, see Star Wars: Battlefront II. Elite Trooper Deluxe Edition also available. Hor+ gameplay and pillarboxed 16:9 cutscenes. 47-110° vertical FOV via slider scale. Not selectable in-game, but setting exists in configuration file. TAA Low, TAA High and resolution scale for SSAA. Cheat Engine can be used to disable effects such as depth of field, film grain, filmic effects, radial blur, and vignette. Includes Localizations for Spain and Latin America. 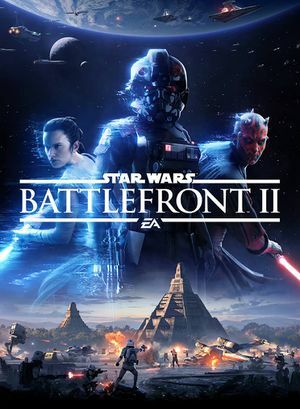 See Helix Mod: STAR WARS Battlefront II (DX11). ↑ Matti Hietanen on Twitter: "CE Table for disabling some effects and DoF"
This page was last edited on 15 April 2019, at 10:38.